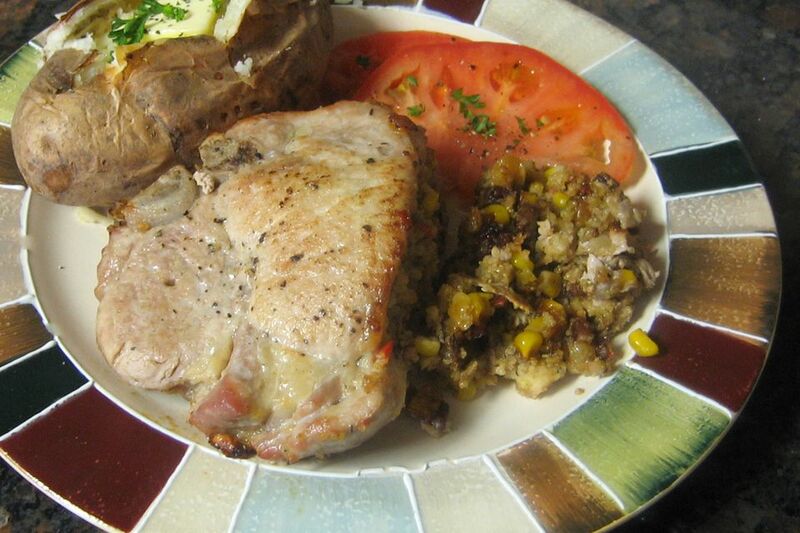 These stuffed pork chops would make a nice dinner party entree, or halve the recipe for a special dinner for two. Cut a pocket into the meaty side of chop, cutting in all the way to the bone. In a saucepan, heat butter over medium-low heat; add celery, onion, and bell pepper. Saute vegetables until tender. Add remaining ingredients, adding enough chicken broth to moisten as desired and taste before adding salt and pepper. Stuff pockets of pork chops with the stuffing mix. Set remaining stuffing mix aside. In a large skillet over medium heat, brown the chops, turning carefully to brown both sides. Push chops aside and spoon remaining stuffing in the middle of the skillet (if your skillet is not oven-safe, use a baking dish), then position the chops over the stuffing. Cover the skillet or baking dish and bake at 350° for about 25 to 30 minutes, until chops are cooked through.